So, apparently YA paranormal romance can be original! Kate’s parents have passed away in a car accident, and together with her sister she moves in with her grandparents in Paris. She is just a whisp of her former self, trying to deal with the fact that her parents are gone. Then she meets the mysterious Vincent, who has more secrets than Kate would have ever expected, and she slowly returns to the land of the living. Ms Plum dedicated Die for Me to her mother, who she still misses every day. The fact that she lived through the loss of a parent shows in Die for Me; the whole grieving process, the numbness, it’s all so realistic. The first part of the book is emotional, but it doesn’t get too depressing. I loved the dynamics between Kate and her older sister. They bicker, they’re very different, but they love each other and are always there for each other. It was nice to read a good sibling dynamic in YA; most main character seem to be only child or have a much older/younger sibling. This story features a particular type of supe, revenants. I won’t go into their specific powers as other reviews do, as I feel knowing what they can do will take some suspense out of the story. Let’s just say that I like the way they work, and I’m looking forward to find out more about them, as I’m getting the feeling we will discover a lot more about their lore throughout the series. Of course it’s impossible to review a romance without talking about the romance itself. It was… good. Kate feels an instant attraction to Vincent, but she puts the attraction into perspective instantly. I’m not a big fan of Vincent personally – he was fine, but just a tad boring. He treats Kate well though, and to be honest that’s all I require from a romance. 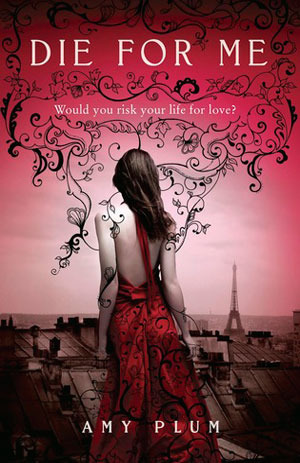 As for the plot, Die for Me, like many other paranormal romances, is more character-based than plot-based. Most events hinge on interaction between characters, instead of moving a certain plot ahead or discovering new information. Like we’ve seen before in books like Twilight and Fallen at the end of the book we get to see some action, which I enjoyed. It wasn’t as horribly clichéd as it could have been. I hope Kate will become a bit more independent in next books, in the sense of that she doesn’t have to rely on Vincent for protection against the baddies. Die for Me manages to stay away from being run-of-the-mill paranormal YA by featuring believable emotions and realistic sibling-dynamics, and the fact that her boyfriend isn’t abusive or creepy in any way makes it a lot better than most YA romances I’ve read.